We frequently see questions on our advice forums asking about tiling over Schluter’s Kerdi-Fix sealant when it’s been smeared excessively over Kerdi waterproofing membrane while being used for various sealing applications where the normal overlap with thinset mortar just wouldn’t fit the bill. When asked, the folks at Schluter Systems have told us they’d never really tested it, mostly because you’re not supposed to end up with a significant amount of the Kerdi-Fix exposed on the Kerdi membrane. But what if you should, in a real-life shower construction, somehow get a significant amount of Kerdi-Fix out on the exposed areas to be tiled? If that never happened, I really doubt we’d have gotten this particular question so regularly, now would we? So, the Whirl-Famous Tile Your World Test Team decided to take it upon themselves to find out just how well the recommended thinset mortar would adhere to an area substantially covered with Kerdi-Fix. To make the test, we first installed a swatch of Kerdi membrane to a scrap of regular gypsum board using Ditra Set as our bonding mortar. This sample board was allowed to cure for a couple days and then Kerdi-Fix was smeared in a band about four inches wide across the middle of part of this test board for a foot or so to make a substantial mess. The Kerdi-Fix was permitted to cure for a couple days. 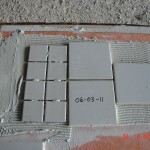 Tiles were then set on the sample board, again using Ditra Set. Some were 4×4-inch non-vitreous glazed tiles and some were porcelain mosaics. The tiles were set such that some were about half on clean Kerdi and half on Kerdi-Fix, some were only on Kerdi-Fix, and some were only on clean Kerdi. No great care was taken in setting the tiles and yes, the fella that set that one with less than 95% coverage has been counseled. 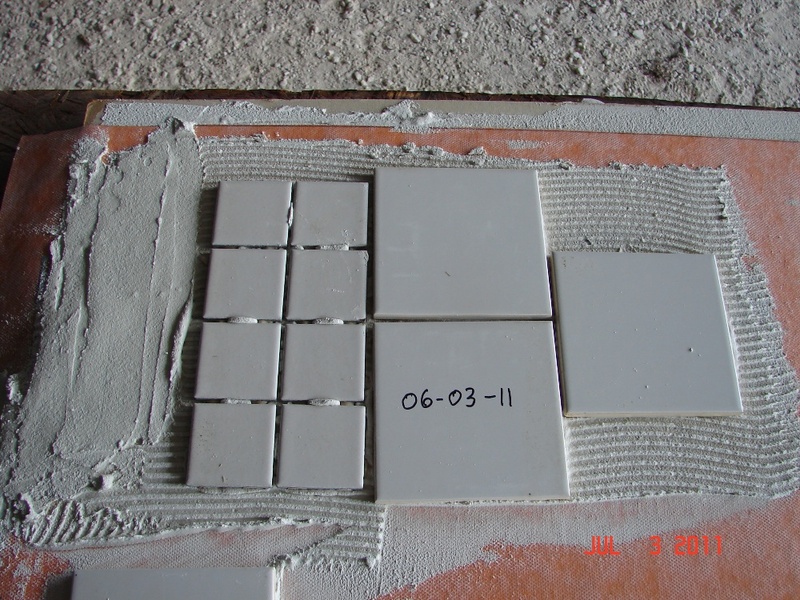 These tiles were allowed to cure for more than seven days and were not grouted. The test board looked like this, with the Kerdi-Fix, which is not visible, running about one 4×4 tile wide from left to right under the sample tiles. 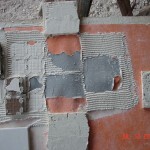 The tiles were then pried off the board using a stiff putty-knife and subjective note was taken as to how much force, relatively, was required to remove a tile from the clean Kerdi membrane areas as opposed to that required to remove the tiles from the Kerdi Fix. While our test facility is certainly almost state-of-the-art (some of it even has concrete floor), we still lack a proper shear test jig, so the finely calibrated putty knife was the only test tool available to us. And I really do think it was sufficient. 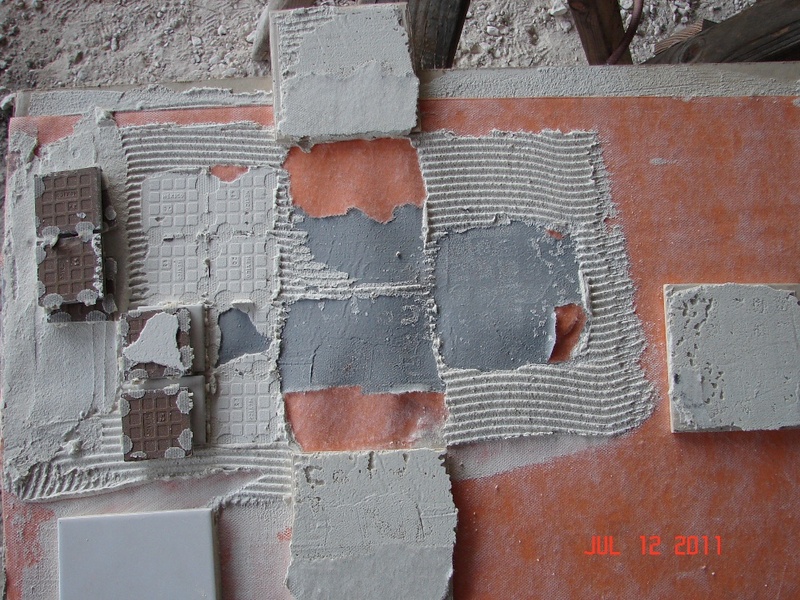 As you can see, the soft-bodied tiles came off both the Kerdi and the Kerdi-Fix areas intact and with virtually all the bonding mortar attached to the tile. The force required for removal from the Kerdi-Fix areas was substantial and very nearly the same as that required for removal from the Kerdi membrane. At the Kerdi/Kerdi-Fix boundaries some of the Kerdi-Fix was pulled off the Kerdi membrane and remained with the mortar and fleece on the tile. Difficult to see in the photos, you kinda had to be there. You can also see the wrinkling in the Kerdi where the membrane was pulling off the test board before the tiles separated from either the Kerdi or the Kerdi-Fix. The porcelain mosaics (which were not keyed-in) mostly came off without any bonding mortar on the backs, but a couple pulled a good bit of mortar off the Kerdi-Fix while also beginning to pull the Kerdi off the substrate. This still required enough effort that I would have no fear of a failure in a shower under any use conditions. While I would always try to avoid smearing a lot of Kerdi-Fix anywhere I intended to set tile, I would have no concern at all about tiling over such areas should the situation occur. I can’t testify to the actual shear bond achieved with Ditra Set over Kerdi-Fix, but I would be happy to wager heavily that it will be above the minimum 50psi required for tiling over the Kerdi membrane. My advice would be that you not make a habit of smearing the stuff where it’s not needed, but don’t lose any sleep if you have to tile over a patch of Kerdi-Fix. Kelly Chaplin is a partner and Vice President, Technical, at John Bridge and Associates LLC, which operates the John Bridge Tile Advice Forums.